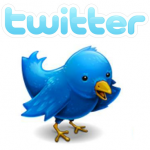 Twit­ter is one of the most used micro blog­ging plat­form. Every day, more than 400 mil­lion short mes­sages (140 char­ac­ters, called tweets) are posted in user’s pro­files. The com­mu­ni­ca­tion in Twit­ter is per­formed by adding in the text a user’s ref­er­ence pre­fixed by a @ char­ac­ter (for instance @lpttwer). Indeed, words that begin with # have a spe­cial mean­ing and rep­re­sent a hash­tags (for exam­ple #sim­ple­science). In the last years, hash­tags have turned out to be a very pow­er­ful and effec­tive way of tag­ging con­tent, search­ing or detect­ing trend­ing top­ics in this vir­tual community. Because of that, we are con­cerned in under­stand­ing how the way users employ hash­tags is chang­ing, and in par­tic­u­lar how the hash­tags’ length is changed in the last months. The plot on the left con­tains the aver­age hash­tags length as a func­tion of time. We base our find­ings on a set of more than 1.2 bil­lions tweets, col­lected between August 2011 and Octo­ber 2012 (aver­aged by weeks). It is clear from the fig­ure that the aver­age length has increased in the last 18 months. 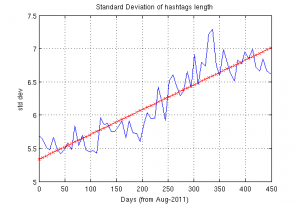 One of the pos­si­ble expla­na­tion of this phe­nom­ena is that the widely use of hash­tags in online com­mu­ni­ca­tions has lim­ited the unused words and con­se­quently, users have to choose longer hash­tags (maybe com­pounds words). How­ever, this pic­ture of the sit­u­a­tion is far from being complete. 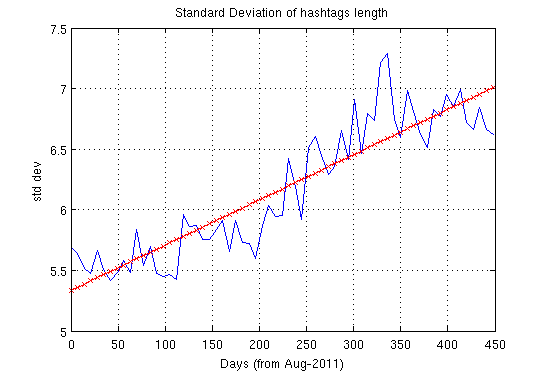 In fact, we see that the stan­dard devi­a­tion of the hash­tags lengths (plot on the right) has increased too as time pass by. 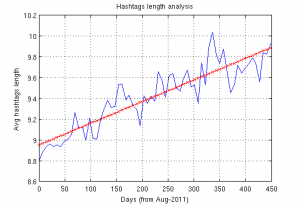 This cap­tures another impor­tant fea­ture of the hash­tags’ dynam­ics. Not only the aver­age length is becom­ing big­ger, but also the vari­a­tion of the lengths com­pared to the aver­age is chang­ing, mean­ing that the longer hash­tags increase faster than shorter ones. This entry was posted in simple science, twitter and tagged hashtags, research, science, twitter by possadmin. Bookmark the permalink.